A Museum for the American Style Water Pumping Windmill and Related Exhibits on Wind Electricity. The purpose of the AMERICAN WIND POWER CENTER, as a 501 (c) 3 non-profit organization, is to interpret the relations of humans, the environment and technology through the medium of a museum of wind power history. Renewable energy may be chic, but that isn’t why America merits a windmill museum. It’s because of Billie Wolfe, a Texas home economics teacher. She liked old windmills, and thought they deserved a museum because prairie settlers couldn’t have survived without them. “The First Lady of the Windmill” died in 1997, months before the museum opened, and years before windmills revived as one of America’s desperate post-oil hopes — as wind turbines. The American Wind Power Center displays its own working wind turbine (built 2005), the first within a U.S. city limit. 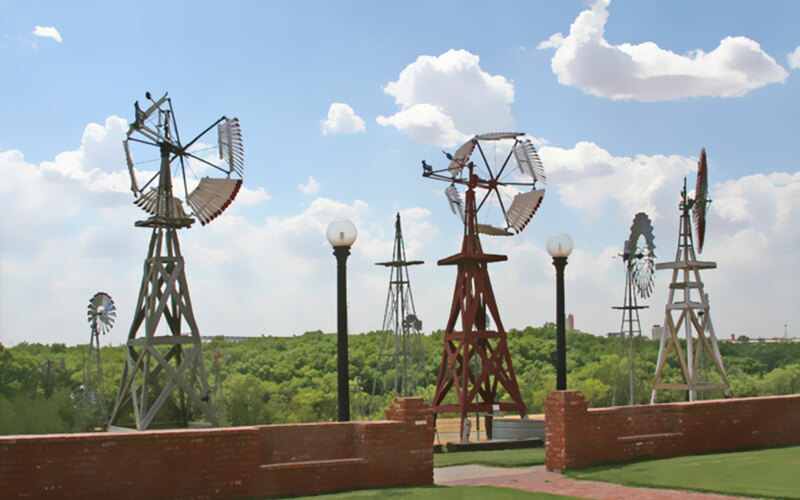 It towers over dozens of older windmills scattered across the museum grounds, their wheels rhythmically creaking in the West Texas breeze (Lubbock is one of the windiest cities in the U.S.).